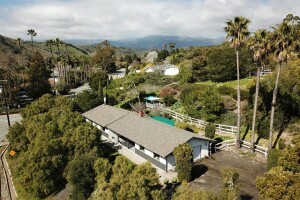 Walk or bike to the beach from this very private, quiet, .80 acre property in Rancho Embarcadero. Notable features of the home include a comfortable sized living room with vaulted wood ceilings and floor to ceiling stone fireplace, master bedroom has attached ¾ bath and 2 bedrooms share the full bath off the hall. Enjoy outdoor living under the back patio cover or spend time in the gazebo watching the local wildlife. Large open area located on the west side of the house could accommodate a pool, sport court or horse facility. Gated drive has plenty of parking for multiple cars, RVs or boats. Rancho Embarcadero is a Municipal Improvement District, in the County of Santa Barbara. Included for use are a community clubhouse, park, playground and a horse ring.